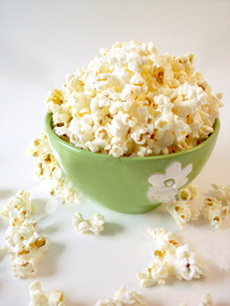 Popcorn is a whole grain, but oat bran isn’t. STEPHANIE ZONIS is a Contributing Editor to THE NIBBLE. This is Page 2 of a 7-page article. Click on the black links below to view the other pages. People have been eating whole grains for thousands of years. 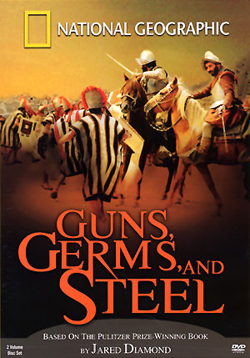 In Guns, Germs, and Steel, author Jared Diamond identifies eight so-called “founder crops” as being among the earliest to be cultivated by humankind. Included in this group are barley, flax, and einkorn and emmer wheat (the latter being one ancestor of durum wheat, common or bread wheat, and kamut, a lesser-known type of wheat). These founder crops may have been grown as far back as 9000 B.C.E. in the “Fertile Crescent” of Middle East. * Other grains have been cultivated for nearly as many millennia. Rice may have been grown in what is now Thailand as far back as 4000 B.C.E. And corn probably predates that, having been grown perhaps as early as 6000 B.C.E. in Central and South America. Millet, teff, and spelt are further examples of cereal grasses that have been providing nourishment to our species for countless generations. In fact, whole grains have been a dietary staple for the bulk of the world’s populations for millennia. Most grains must be processed to be edible, but very early “processing” must have been minimal indeed. Probably, grains were first eaten raw, but it must have discovered early on that they were easier and more pleasant to consume, and could provide more variety in the diet, when cooked or baked. This required milling to remove indigestible outer hulls and grind the grain, especially where flour was desired. An additional bonus was that grain and flour, if kept dry and out of the reach of pests, could be stored, so either or both would yield a food source for winter or in times of scarcity. Grain also provided an essential component for certain alcoholic beverages, notably ale or beer, valuable sources of carbohydrates and calories for some societies and another means of preserving the grain. It’s worth mentioning that larger-scale civilizations did not begin to flourish until people could grow and store enough food in one area to survive—a change which put an end to the previously nomadic lifestyle and allowed for greater population growth. Whole grains must have been an essential part of this early alteration of human behavior. *The area is named for its crescent shape and fertile soil, and is also called the “Cradle of Civilization.” It incorporates Ancient Egypt, Ancient Mesopotamia (the location of the Tigris River and Euphrates River valleys—Mesopotamia means “land between the the rivers”) and the Levant. 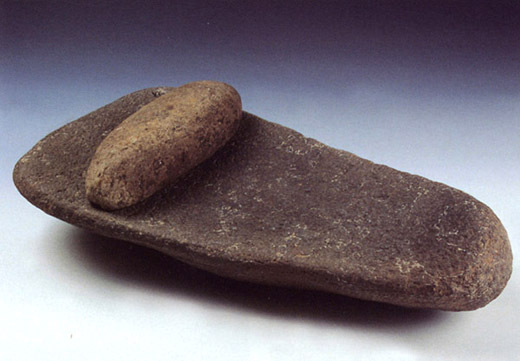 This saddle quern and rubbing stone, made of basalt and limestone, is circa 7000 B.C.E. Harvested grains were ground with a rubbing stone that was pushed back and forth over grain that was placed on the surface of the quern, a wider, heavier stone that was set in the ground. Basalt was an ideal stone for making querns because it has a very rough surface and is very hard. Photo and information courtesy of Purdue University. While much of the rest of this section applies to wheat, the single most cultivated cereal crop worldwide, it’s easy to see how similar techniques could have been (and were) applied to other grains. There were several types of mills in older societies. One, the saddle quern (photo above), was a saddle-shaped stone on which other stones were rolled to crush grains, a process that must have taken a very long time for the unfortunate individuals (the women of the household) who had to kneel on the hard ground for so long to crush the grains (ancient bones show a large incidence of arthritis in the knees). A similarly laborious and time-intensive mill was the hand quern, consisting of two round, flat stones, one upper and one lower. As the name suggests, a hand quern was a smaller tool, operated by hand. The upper stone, which had a hole in the center into which grain was poured slowly, was turned to grind grain against the lower stone, producing meal. Both of these mills could produce only enough ground or cracked grain for a household or extended family. The Romans are generally credited with being the first to turn grinding grain into an industry. Their mills, while still made of stone, were much larger affairs than the typical household mills, and with greater outputs. Draft animals or slaves were used to operate these mills. Cereal is named after Ceres, the Roman goddess of growing plants, particularly cereals (grains). At some point before milling became an industry, it was discovered that less-coarse flour could be obtained by sifting ground grains. Baskets or sieves were lined with woven horsehair or papyrus. When flour was sifted through them, the coarser bran particles were left in the sieve, while the flour that went through the sieve was much finer in texture. Eventually, the Romans used linen to sift their flour; one Antiphanes writes about commercial baking with sifted flour about 350 B.C.E. However, the process of sifting, which required more time and materials than regular meal or flour, meant that sifted flour was expensive, and only the wealthy could afford bread made with it. As might be expected, this “refined,” sifted flour, which was of a lighter color than the darker bran, became a status symbol. In Roman times, sifting was invented, creating white bread. 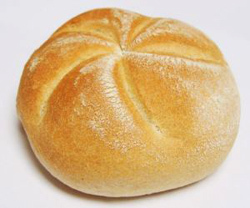 It became an immediate status symbol, since sifted flour was more expensive and thus, only the wealthy ate white bread. Photo by Darek Tyka | SXC. Bread made from unrefined, unsifted flour was thought suitable only for the lower classes, slaves and, interestingly, athletes. By 50 C.E., bread made from sifted flour was being produced on a large commercial scale through much of the Mediterranean. Incidentally, although this flour had been “refined,” it was a far cry from the bleached, ultra-refined white flour that pervades our society. Gradually, the milling process itself became “refined,” especially through developments such as watermills and windmills, which required neither animal nor human power to operate. Still, the milling process remained largely unchanged until the invention of the roller mill in the early 1870s. Roller mills, usually made of steel, operate at high speed and high temperatures. The huge quantities of flour (far lighter in color) that can be produced by these mills meant that refined flour was no longer a luxury product for the wealthy. With the invention of the roller mill, refined flour became available to the masses in industrialized nations.